Hey, party peeps! I’m continuing today with my Tablescape Design Series where I share with you how to style a dining table 5 different ways for 5 different party themes using solid colored tableware. 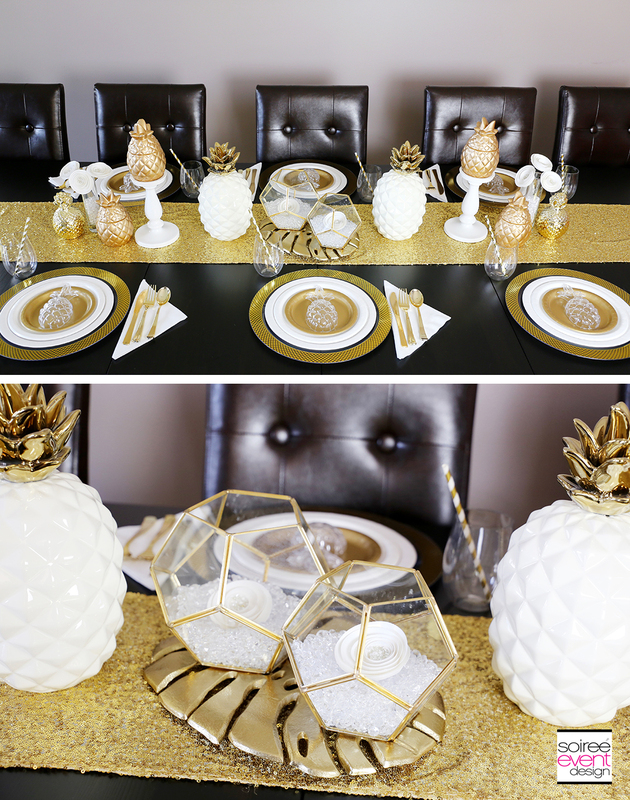 Today it’s, HOW TO STYLE A MODERN GOLD PINEAPPLE PARTY TABLESCAPE! In my last post, I showed you how to style a table using metallic silver. Today I’m going to show you how to use metallic gold. 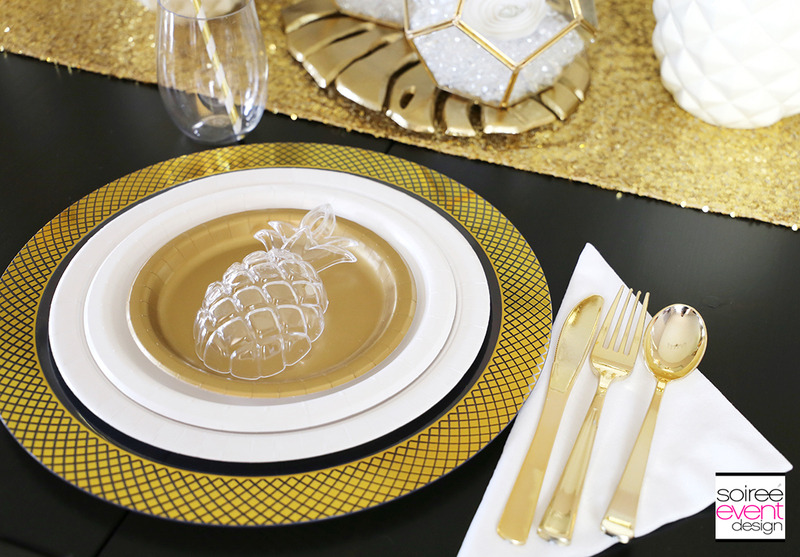 This Modern Gold Pineapple Party Tablescape combines two of the hottest new design trends—gold and pineapples. I love how well these pair together. 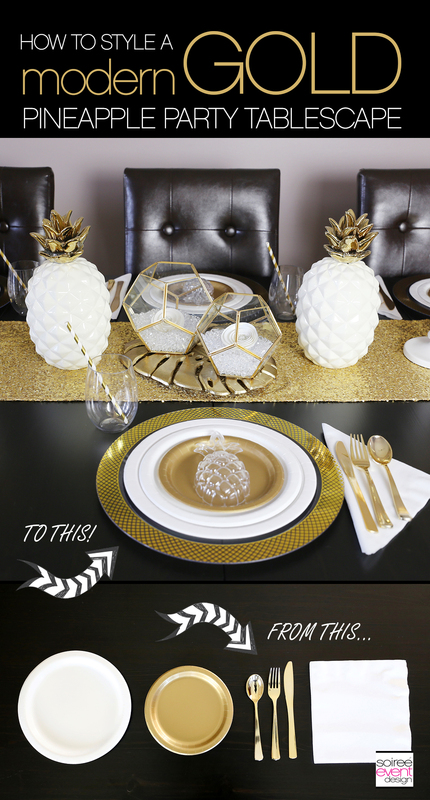 Recreate this stunning Modern Gold Pineapple Party Tablescape year round with my Girlfriend Tips and an online shopping list below with prices to make this super easy to do yourself. 1. 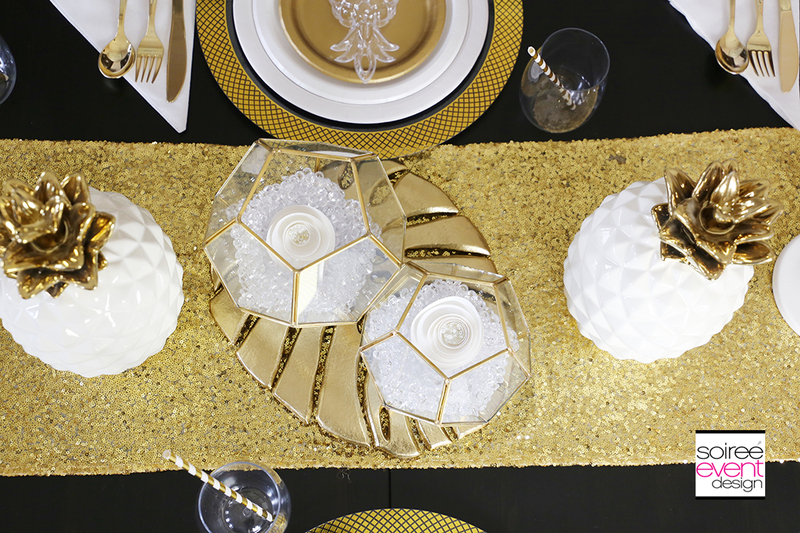 GIRLFRIEND TIP: START WITH METALLIC GOLD & WHITE PARTYWARE! To give this table a modern feel, pair bright white with metallic gold partyware. Keep your design with only these two colors. The finished look is high-end and modern. Don’t forget to use disposable gold metallic cutlery. They look amazing and are a fraction of the cost of buying actual gold tone cutlery. I mean, REALLY more affordable y’all! 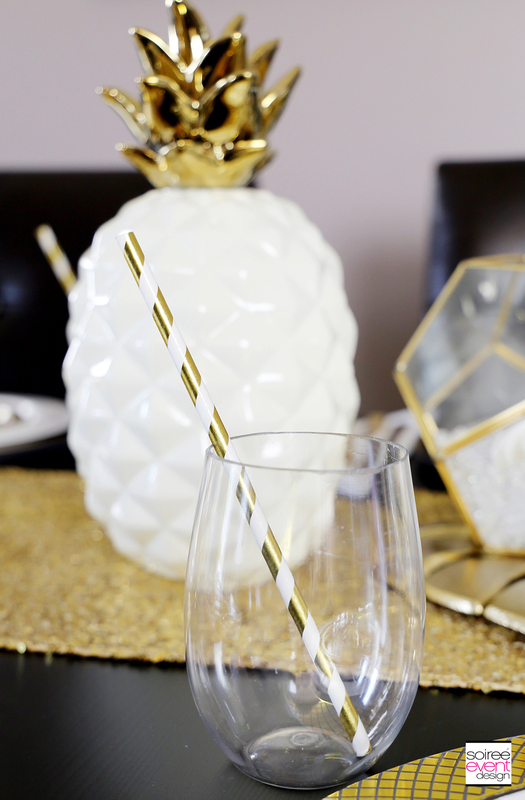 These stemless wine glasses look awesome paired with gold and white striped paper straws. I wanted to use a shorter drinking glass so that the pineapple decorations down the center of the table were easily seen and not blocked by a tall glass. 2. 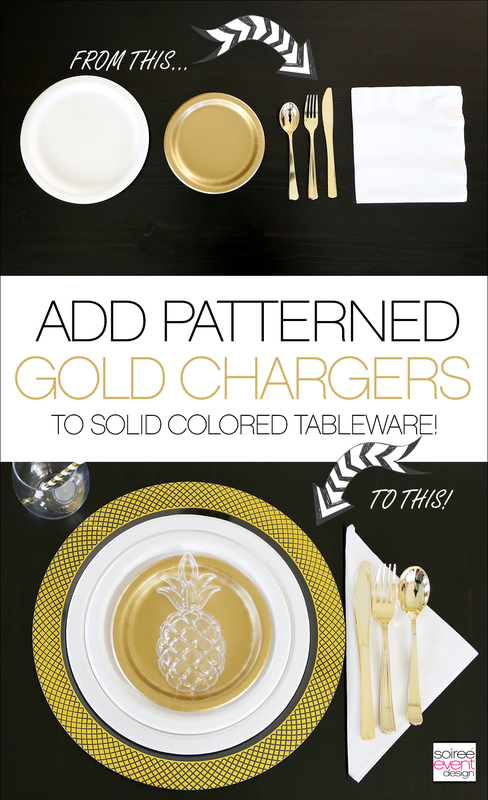 GIRLFRIEND TIP: ADD PATTERNED METALLIC GOLD CHARGERS TO YOUR PLACE SETTING! 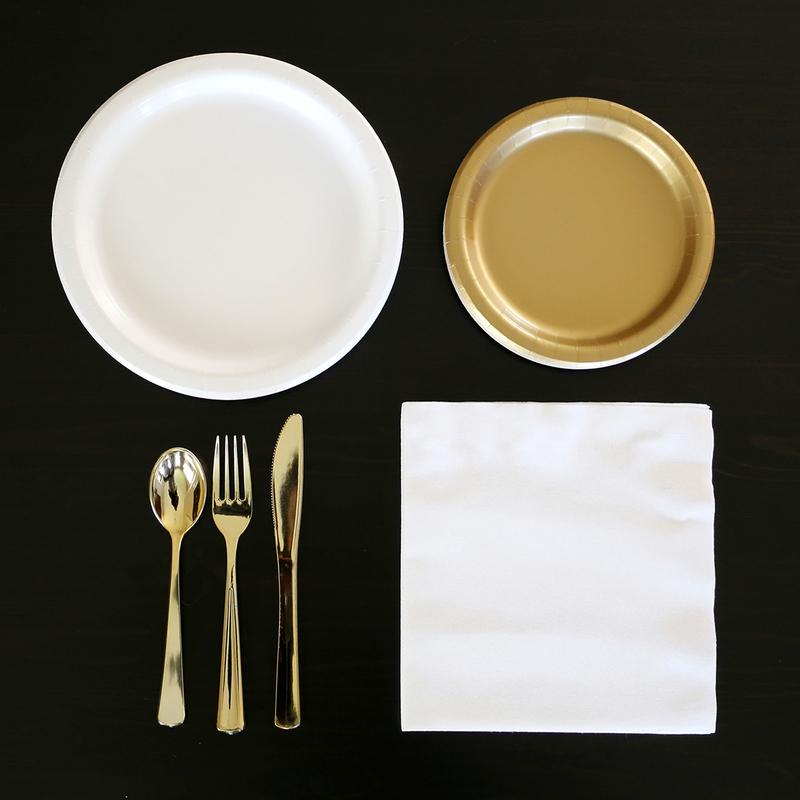 To keep your place setting from looking too flat, add patterned metallic gold chargers under your solid colored plates. These gold metallic chargers have a criss-cross pattern on them that reminds me of the outside of a pineapple. They were perfect and added just the right amount of shine and pattern under the plain plates to jazz up the place setting. 3. GIRLFRIEND TIP: ADD A CLEAR PINEAPPLE FAVOR BOX ON TOP OF YOUR PLATES! Add a clear pineapple favor box on top of your plates to add some visual interest. These pineapple favor boxes from Oriental Trading come in two parts, making it easy to only use one side face down on the plates so they sit flat. 4. GIRLFRIEND TIP: USE GOLD SPRAY PAINT TO CREATE MATCHING DECOR ITEMS! Let’s just face it. Sometimes we can’t find items that we want to use in the colors that match our party table. In those cases, I simply coat them with spray paint in the color to match. Here, I wanted to use gold pineapples in my table decorations, but couldn’t find any that were in my budget. They were around $10-15 each. I found ceramic pineapple drink tumblers from Oriental Trading that were affordable, but they were yellow and green! NOT the color I wanted, so I spray painted them to match! How fabulous are these? At $12.99 for 4 of them, I was able to get 4 ceramic gold pineapple decorations for $3.25 each! NOW, that’s a tip that I can get with! Add some height and place a few on candle pedestals. 5. GIRLFRIEND TIP: ADD MATCHING DECORATIONS YOU ALREADY OWN! I already have these fabulous white and gold pineapple ceramic decorations, gold pineapple candles, gold terrariums and gold metal leaves in my office, so I simply placed these down the table and now have a centerpiece that cost me nothing. 6. GIRLFRIEND TIP: SAVE MONEY AND USE A SEQUIN RUNNER INSTEAD OF A FULL SEQUIN TABLECLOTH! Y’all know I love me some sparkle! I just love the look that sequin tablecloths give my party tables, but, I’m not going to lie, they are expensive! A more affordable option is use a sequin runner instead. You still get the sparkly high end look of sequin in your table design at a fraction of the cost of using a full sequin tablecloth. 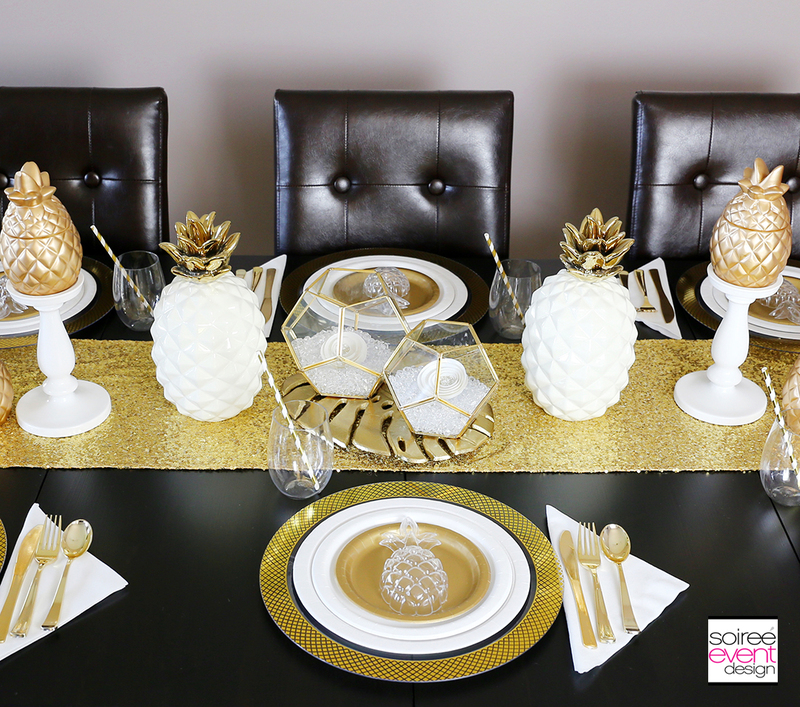 PIN THIS MODERN GOLD PINEAPPLE PARTY TABLESCAPE FOR LATER! 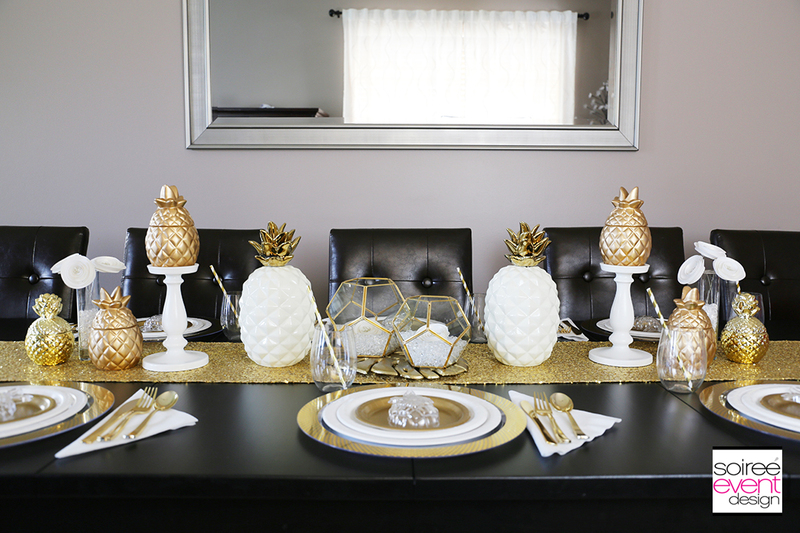 HOW MUCH DOES THIS MODERN GOLD PINEAPPLE PARTY TABLE COST? To make this super easy to recreate, below please find a supply list with online links to all the items used in this tablescape along with prices…saving you TONS of time! – Holiday Dining Table 3 Ways! I am crazy about pineapples. This table is so elegant. I love this decor so much. I have a thing for pineapples and the gold ones are just gorgeous. Oh my goodness I am loving this table layout. There is something about the pineapple trend that is going on at the moment that I love. That is stunning. Pineapples are so huge right now, and this look is so bold without being gaudy. Love it! That’s one bold look. It takes a really talented person to use so much gold without it coming off as tacky. I really like this look. This is such a sophisticated way to party with pineapples! I know several ladies who would love this tablescape. I never really thought about doing party like this, but it would be fun. We are going on a Caribbean cruise next year and this would be a fun party to do right before we go! My mom has a pineapple room in her house. I’ll have to show this to her! I love the modern gold color palette used here. I love the look of the gold and white together. I would love to make this my tablescape for my next inner party. |I will have to start collecting some pineapple things. This is so cute and perfect decor for a birthday or dinner party! I love pineapples as a theme! I am really loving this tablescape. This would be lovely for a summer dinner party. Pineapple always reminds me of the TV show Psych. What a great golden tablescape idea! What a beautiful decorated table. I love all the golden touches in your set up. This is such a gorgeous tablescape. How cute is this? What a lovely idea for a dinner party. This is such a gorgeous table idea! I love to have something like this set up when we have company over. 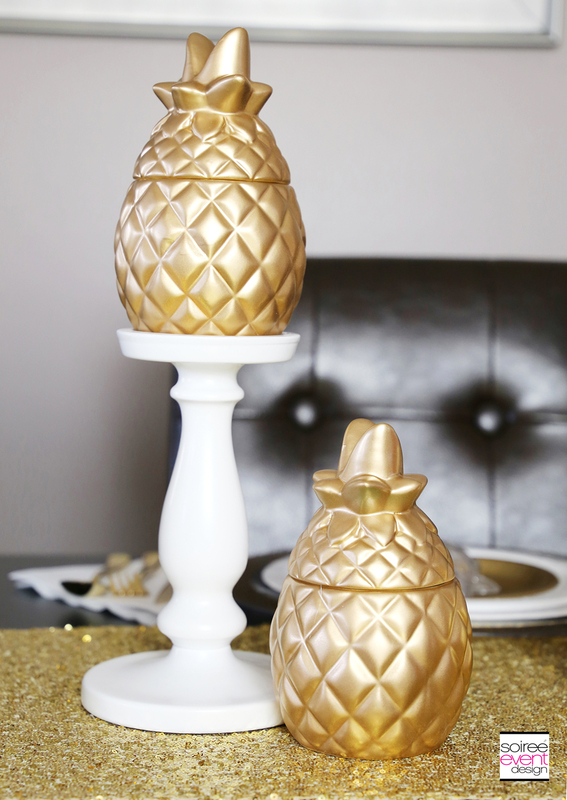 How elegant is this gold pineapple party! It’s awesome that you chose gold to work with. I totally love the decor! The centerpiece is definitely my favorite part of the tablescape! I love what you did with the pineapple tumblers you found as well! I love this tablescape! It’s perfect for a classy end of the summer party! 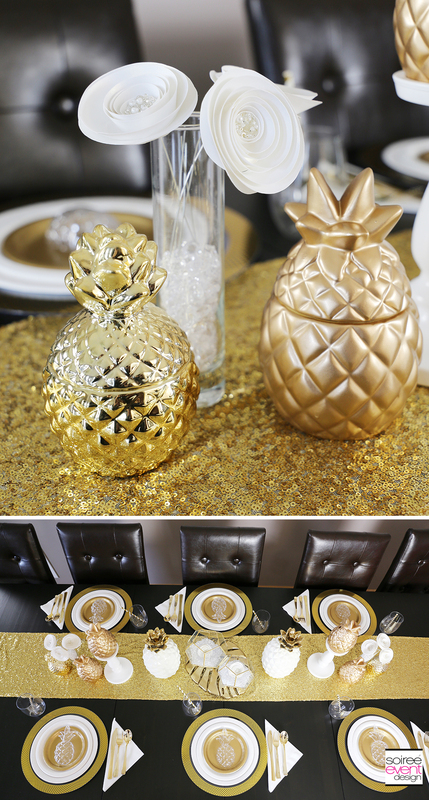 I love the way you set up for the gold pineapple party! I would totally do this setup! Thanks for listing the prices. It makes it seem so less out of reach when you know that it is affordable for REAL people. This is absolutely stunning! I am so going to style my next event with these chic tips! Thanks! I love it! Pineapples are a FAV of mine. I love how elegant they look! This is amazing! I really love the idea and how it turned out! So awesome! Excellent blog post a fab insight into professionally styling a table setting love the pineapple themes and your images are great! This is seriously SO cute! Pinning for later <3 Thank you for sharing! I love the idea and the set-up looks very chic. I may borrow your idea. Goodness me, how elegant and cool is this setting! You have just saved me from a bland table for my upcoming dinner party. I am taking all these tips with me! I loved it from the very first photo. Great design and outstanding photography! It makes me think of Christmas around the corner with the gold. This party is glamorous! It always is when gold, white, and black are present! I really like those colors together! This is so cute! I would have never thought to go with this theme, but it is so pretty. I love the metallic and the pineapple is great! I would love to do this for my next girls get together. I am obsessed with all things gold pineapple. I buy one whenever I see it in the stores! Oh wow! This is absolutely gorgeous! I love the setting and color combination. Great job! That gold pineapple party setup looks so stunning. I really like the entire decor. Good job!! Oh my goodness this decor is absolutely gorgeous. I can’t stop thinking about eating dinner by that lovely gold tone cutlery. Those two colors gold and white match really well. This pineapple themed looks beautiful. I really like the whole setting. Perfect for all occasions. I love this tablescape! Pineapples is such a unique design, it would be perfect for any occasion. I love the modern look of the gold ith the pineapple theme. I have been wanting to find a cute party theme for a brunch I have coming up and your party ideas would be perfect. Wow, I am in love with this decoration. Everything on that table is perfect! How pretty this is! I love combination of gold and white. You just gave me an idea. Thanks for sharing. This is beautiful! I want someone to do this for my next birthday. I love pineapples! Modern style is always nice to look at. I love your decoration!!! Oh my. This tablescape is so elegant looking. All the gold designs are awesome. The golden pineapples definitely made the impact. There is just something about seeing pineapples that always makes me happy. I love the mix of white and gold in this partyscape. It’s so chic and modern. This is such a fun look! I love the gold pineapples so much! I love your table scapes! I am so glad you post the prices, too. It is fun to see what it takes to make a table look like that! Your latest tutorial makes me jaw-dropped. It’s so gorgeous and very creative! All of that gold is beautiful! I never seem to be able to put together anything like this – I love how you added so many little details! Very pretty. I was browsing wayfair for decor last night and pineapples were the number one trending item! You definitely found a great way to use them. This setting is fab! I love everything about this tablescape! Especially the gold, black, white theme. It’s perfect! oh, my goodness! I love the whole set up. So cute and classy. Great job! This is such a gorgeous look! I love the combination of white and gold, and am totally obsessed with pineapples right now! What a gorgeous tablescape! There’s something so lovely about gold paired with a simple white. Brightens everything. This looks absolutely gorgeous! I always loved the color gold, especially in decorating! Pairing it with white really helps to make it pop! This looks awesome, thanks for sharing! I’m amazed! that table looks fabulous! This is absolutely stunning! And it’s so simple. I’ll have to try this some day.